By Kori ~ November 29th, 2010. Kori S. Voorhees, our Wine Peeps Editor-in-Chief, is also a regular contributor to Washington Tasting Room Magazine, a quarterly magazine that focuses on Washington State wine with articles about wineries, vineyards, travel, and lifestyle. The following article, written by Kori, appeared in the Spring 2010 issue. If you drive by DuBrul Vineyard, near Sunnyside, from mid-February through harvest in the fall, you are likely to see the ladies of their vineyard crew hard at work. They might be pruning, thinning, or doing whatever is necessary to take care of this 45-acre world class vineyard. DuBrul Vineyard was planted by physician Hugh Shiels and his wife Kathy in 1992. At the time they purchased it, the land was home to an apple orchard and a meager seven acres of Riesling vines. Those Riesling vines, some of the oldest in Washington State, are still there today. The apple orchard, however, was torn out in order to plant Cabernet Sauvignon, Merlot, Syrah, Chardonnay, and Cabernet Franc. Those initial plantings were done under the expert supervision of vineyard consultant Dr. Wade Wolfe (now owner of Thurston Wolfe Winery). When Wolfe got promoted at Hogue Cellars, Stan Clarke took over the development of the vineyard. A Washington wine icon, Clarke worked with the Shiels from 1996 until his untimely death in 2007. 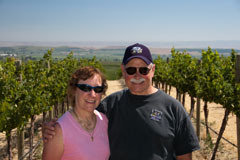 Today, Rick Hamman is their viticultural consultant. Through all three consultants, the one constant has been vineyard manager Larry Dolan, who has been there since the beginning. Under Dolanâ€™s watchful eye, DuBrul is committed to sustainable farming practices. During a drought in 2005, they dug a naturally filling pond in the hydrology draining wedge on their property which allows them to provide the vineyard with normal irrigation even in years with limited rainfall. DuBrul Vineyard, named after Hugh Shielsâ€™ motherâ€™s maiden name, is truly a unique site. 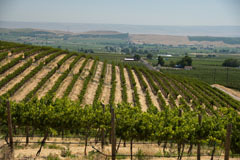 The vineyardâ€™s steep, rocky, south-facing slope is situated on a basalt promontory with gorgeous views of the Yakima Valley in all directions. It boasts many different aspects, multiple elevations, multiple exposures, multiple slopes, and multiple soils, which are planted to maximize the growing conditions for different grape varieties. Winemaker David Oâ€™Reilly of Owen Roe, DuBrulâ€™s largest customer, speaks highly of the vineyard. He makes numerous single-vineyard wines using DuBrul fruit, including a Merlot, a Cabernet Sauvignon, a Syrah, a Chardonnay, and a Riesling. Oftentimes, wine critics will perpetuate an idea about a particular region by saying that a certain area is great for growing one particular variety. When you look at DuBrul Vineyard, that theory is challenged. 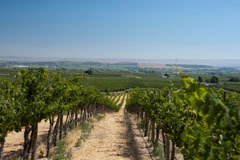 â€œWhere else can you find a single-vineyard with world class Cabernet Sauvignon, Merlot, Syrah, Chardonnay, and Riesling? It is just unheard of,â€ says Oâ€™Reilly. The common thread that emerges when speaking with winemakers who use DuBrul fruit is the attention to detail that goes into every aspect of the vineyard. â€œEverything we do is hand-harvested, hand-worked, and nothing mechanical. We differentially irrigate within a row and really manage everything to the nth degree,â€ says Kerry Shiels. During harvest, Hugh Shiels, who still works as an orthopedic surgeon, visits the vineyard every morning to check on the crew and give them instructions for the day before he goes to his office. After work, he changes clothes, returns to the vineyard and helps the crew who will be working late into the evening. â€œTo get the quality, you have to be hands on,â€ says Shiels. 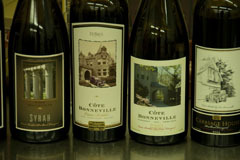 In 2001, Hugh and Kathy Shiels started CÃ´te Bonneville, their estate winery that uses fruit exclusively from DuBrul. â€œBefore the vineyard was ten years old, we knew it was special. So we decided to start our own winery to showcase what the vineyard can do best,â€ says Kathy. That consistency is a testament not only to the vineyard itself, but also to the Shiels family and the ladies of their crew who strive to be diligent stewards of the land. Fascinated by the name DuBrul,I would like to know the history of Hugh Shiel’s mother.Am definitely going to search for a taste of a DuBrule wine.My maiden name is Jeanine Dubrulle,born September 25,1938 in GENT (flemish part of Belgium) French speaking at home. Emigrated to the United States in 1962,fulfilling my lifelong dream.Became a proud citizen in 1967.Widow of Ralph Mac Michael.I have lived year round at Lake Tahoe since 1969.Worldwide travels now reduced to zero due to illness.Love my daily wines.Will now go in search of a DUBRUL wine.May have to contact a friend in Reno. Thanks for sharing your “DuBrul” connection. Best of luck learning more about the DuBrul family and searching out wines from DuBrul Vineyard. Cheers!